As we left Telscombe, we walked past a cutting in the cliffs which led down to a secluded beach. This quiet, out-of-the-way area, which affords a significant degree of privacy, has obviously attracted people to the area who the Council disapprove of. 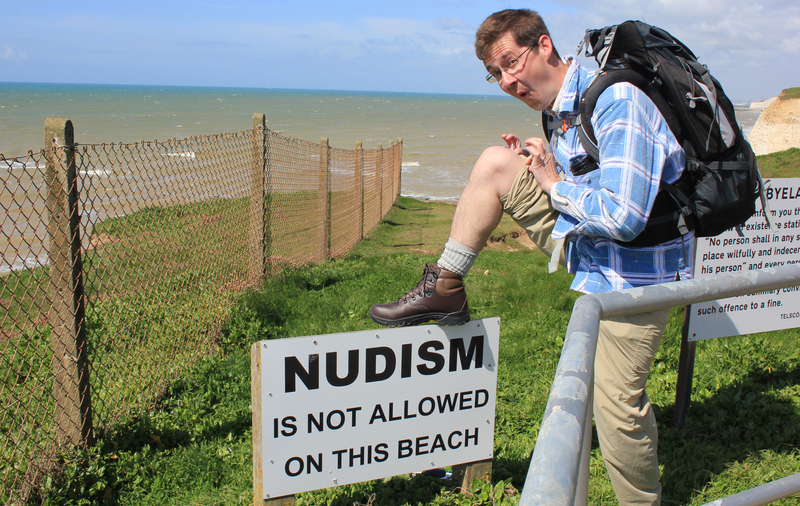 Signs proclaim that “NUDISM IS NOT ALLOWED ON THIS BEACH”. As a stickler for rules such as these, I could not resist flashing a bit of thigh – well, calf, at any event. I tried and tried but could not hitch my trousers up far enough to reveal some thigh. British nudism is at its best, I have always thought, when one is wearing one’s socks. It was good to have a moment of raunchy excitement and adventure on the outskirts of Telscombe, because the coastal path then turned into a rather dreary road trudge towards Saltdean. 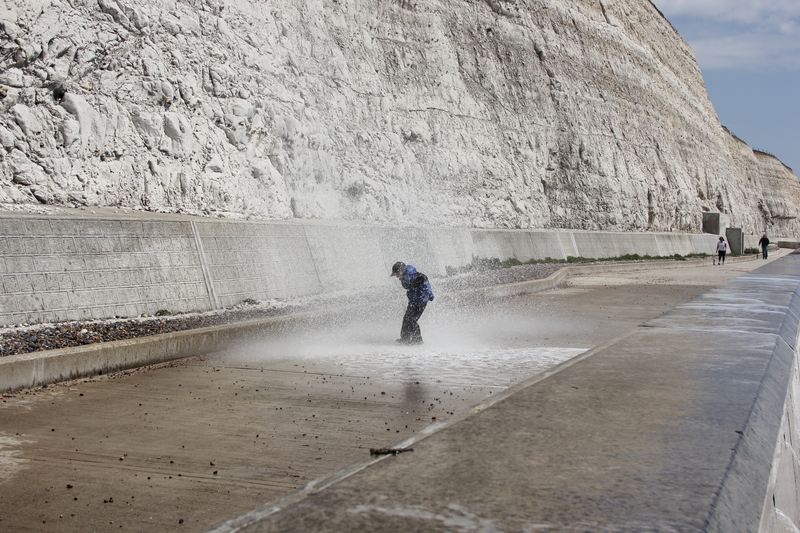 At Saltdean we were finally able to rejoin a concrete promenade running underneath the cliffs. Known as the Undercliff Walk, this runs all the way in to Brighton. It was high tide, and the waters lapped right up to the concrete sea wall. The regularly spaced sections of concrete with regularly spaced handrails on top gave a very regular looking regularity to the promenade which I actually found very pleasing to the eye. 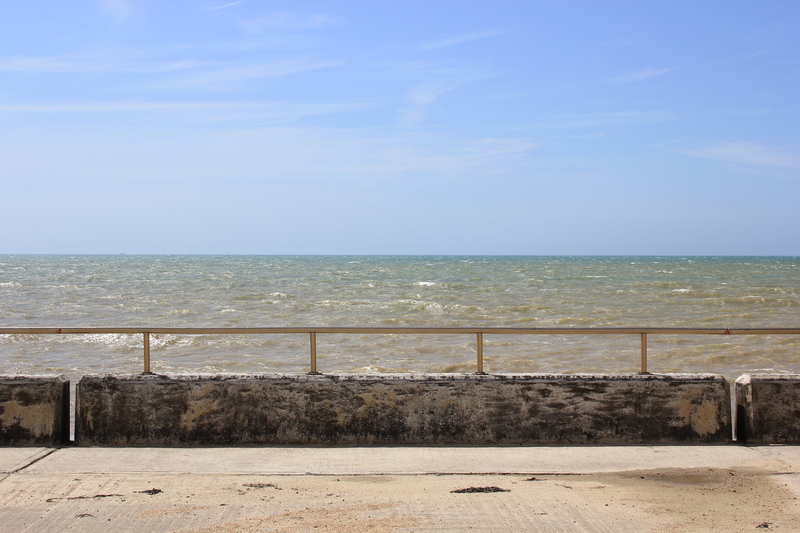 I say the sea lapped at the concrete wall, but it didn’t. It pounded. It boomed. We would hear deep, hollow, thuds as a tremendous wave hit the wall. A split second later a huge tower of sea spray would shoot up vertically and rain back down again on anyone silly enough to stand by the barrier. Like our excited children. Hmmmm. That photo is a bit better, but still not really representative. Maybe if I went round the other side and took a picture from there I would get a better shot which would show the…..WOAH! That was a bit close! The larger waves crashed into the wall and must have soared 20 feet into the air. Ben, our son, stood under them and watched the water shoot over him in a wall of surf. 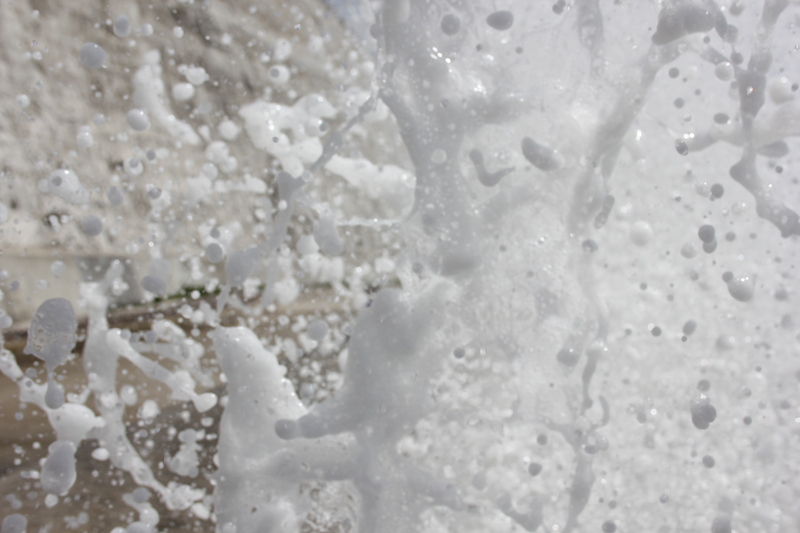 The wave retreated back to the sea, leaving a mass of spray hovering, for a split second, over him. Then, it too would come raining down. For the briefest of moments, it looked as if he had his own private rain cloud which followed him wherever he went. 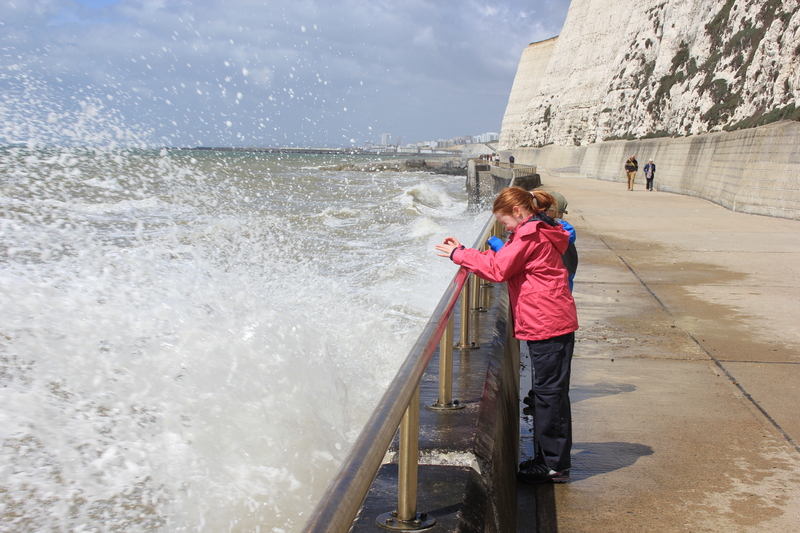 This entry was posted in East Sussex and tagged coast, East Sussex, nudism, rottingdean, saltdean, sea, spray, travel, walking, waves. Bookmark the permalink. Wow, those waves look amazing. What fun your kids must have had! When I walked that section there was a storm brewing, but not big waves. 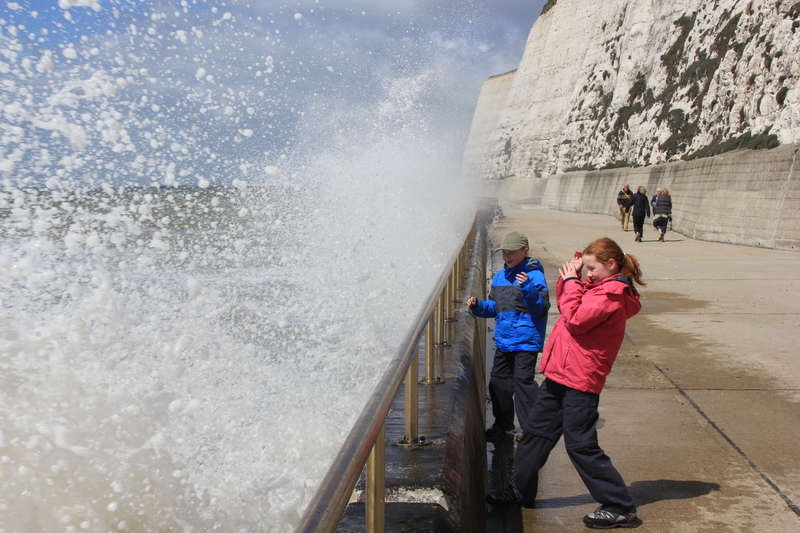 I was more concerned with boulders falling on my head from the chalk cliffs above. We had to physically drag them away, but they kept slipping out of our clutches (being drenched with seawater and therefore being as slippery as fish) and running back for the next wave! One question is will those new boots see the next two nudist beaches, thanks for your comments about route on my blog, i could see a path on google earth but just didn’t find info about it being accessible. Another week and i should be on quite a bit different coast. What a great day for a little bit of everything (thank goodness for that)! 🙂 & Wonderful photos! Re picture #1: Nice boots!